"Don't you worry your pretty little mind, people throw rocks at things that shine..."
As a culture we have this really messed up pattern of behavior where we tell people to SHINE (be famous, stand out from the crowd, stand up for what they believe in, etc., a concept I read about in this article about L'Wren Scott's suicide, I think) and then as soon as they stand up we throw rocks at them. Why do we do this? Most of the time we're afraid that someone else is shining more than we are or might be taking away some of our own glow. And it brings up our own insecurity/failures/past/wounds. So we deflect and find comfort in defense mechanisms such as demeaning the efforts of those who have found their place in the world. We all bring something different to the table, I promise. How about instead of throwing rocks at other people, we reflect on what those rock-throwing-tendencies say about the state of our own hearts, and humbly admit that we might have some work to do. It takes ownership of faults and our own failures. This is hard heart-work. But it must be done. Oftentimes it must be done over and over and over. For the health of our own hearts, it must be done. 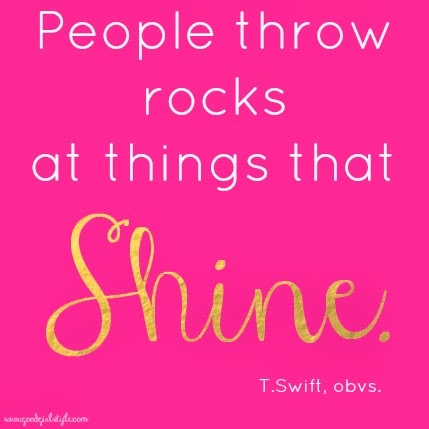 I promise you, you'll never shine to your own full potential while still holding on to a mentality of rock-throwing. And then, in humility and selflesness, let's applaud those who shine. Let's use them as inspiration to be braver in our own lives, to throw off our insecurities so we, too, can shine, and light the world with our collective glow. Wouldn't that be a beautiful place to live? *P.S> If people have been throwing rocks at you lately, like a few people have been in my life, lean in to it. First of all, consider the source. If you deem the source someone in your inner circle whose opinion and voice in your life you value, then you can dig deeper. If not, release it from having any say in your own heart and pray for the other person. The hard thing here is that you might realize someone you thought had your best interests at heart, didn't, and that hurts even more. If it is from someone you value, say to yourself, "What here has merit?" examining the situation, your own heart, and the presence of the Holy Spirit. Strip it down to the essence of what you can work on, and use the rest as motivation. Looking back on my life, the naysayers were actually the ones who helped me access my deeper inner strength when I was struggling. Shine on, you gorgeous thing, you!